Titletown Manufacturing LLC’s enhanced metal surface grinding capabilities provide benefits for industrial customers looking to reduce turnaround times and minimize vendors within their supply chain. The company’s grinding expertise can produce grinding finishes with Ra from 16 to 32. Metal surface grinding in Green Bay, Wisconsin, often requires the involvement of a grinding shop as well as a metal fabrication job shop to complete the project. Titletown Manufacturing brings multiple fabrication aspects under one roof, highlighted by the ability to achieve exceptionally tight tolerances throughout the process. 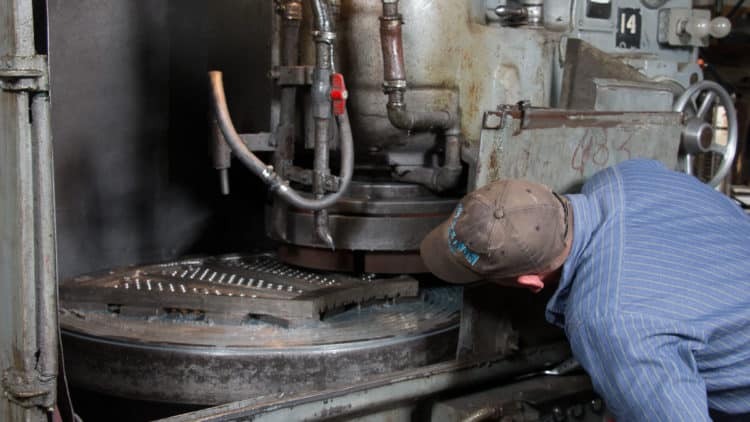 Titletown Manufacturing’s Blanchard surface grinder features a 40-inch diameter table. Its proven technology enables technicians to grind castings and other metal shapes flat before they are milled. This initial production step brings standard steel, stainless steel and hardened materials to tolerances of .003 of an inch and parallels to .005 of an inch. The company’s other surface grinding equipment is used for producing high-quality finishes and tight tolerance thickness to .0005 of an inch. The machine can handle mild steel through materials with hardness levels up to Rockwell 60. Titletown Manufacturing’s OD (outside diameter) grinders are ideal for the paper converting equipment, paper printing equipment and packaging equipment. These machines can handle stock up to 13 inches in diameter and 120 inches long, with tolerances down to .0002 in diameter. Titletown Manufacturing LLC, a trusted Northeast Wisconsin machine shop with more than 60 years of experience in metal parts machining, producing high-quality components and providing custom CNC machining, metalworking, grinding and custom metal fabrication solutions for a wide range of industrial customers throughout the region. The company employs approximately 30 people at its facility at 1252 Marine Street in Green Bay, Wisconsin.